Description: 8 piece tool kit for repairing laptops, tablets, digitizers, cell phones. Universal kit works with most brands. 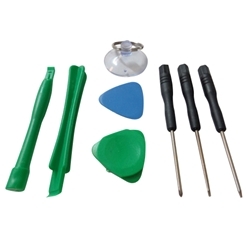 Kit includes 3 screwdrivers, 2 pry tools, 2 pry picks and a suction cup for easy screen removal.